Rcently, I met a group of motorhomers travelling from one hot spot to another to keep winter aches and pains at bay. I was not one of them but over the years, I’ve taken a plunge or two and these are some of my picks. Wairakei Silica Terraces near Taupo was a find. The foundation for the terraces is man-made but the silica that has built up has covered them in the pink-hued coating, like dripping icing, to replicate the drowned Pink and White Terraces. A walkway passes an impressive man-made geyser. Through the valley also runs the hot Wairoa (healthy waters) Stream, which is harnessed into several delightful bright-blue bathing pools set in gardens of ferns and native trees. If you are feeling road weary, a spa service is also on-site. A lounge in the thermal depths was enough for me. The warm water contains 13 different minerals and felt like silk against my skin. The Waiariki pools at Ngawha Springs in the Far North are like those of my childhood—a few holes dug in the ground and the water contained by timber walls. Each pool is joined to the next by rough-hewn boardwalks and the complex is fenced with straightened plastic crates. Each pool is named for its qualities. ‘The Soloman’s’ warmth is soothing, ‘The Doctor’ is reported to have healing qualities, and ‘The Bulldog’ is named for its high temperature. The pools vary in colour according to their level of minerals, from milky to moss-green, grey, and black. These cauldrons of old volcanic activity have been there for a long time, used by Maori long before any pink skins arrived. Apparently, Maori Chief Hone Heke brought his wounded soldiers to Ngawha Springs for healing. 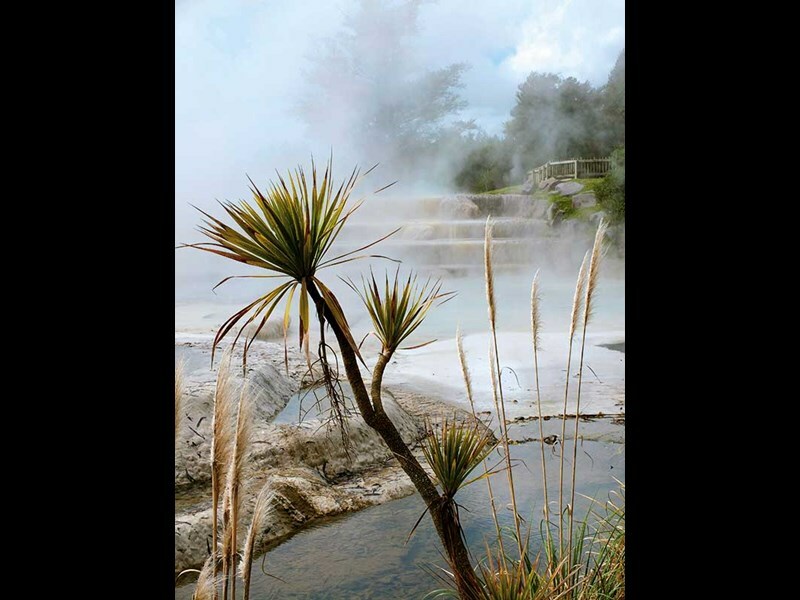 Popular for Aucklanders, Parakai Springs may be less known to out-of-towners. 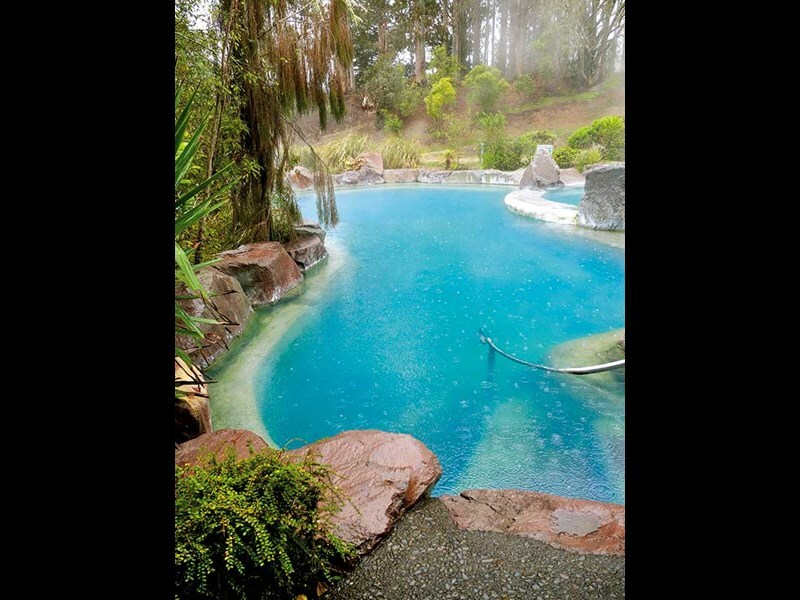 The pools are in a prime position on the Northern Scenic Route and close to the distinctive village of Helensville. They’ve been operating since 1883 when a geothermal spring—not much more than a muddy hole—was turned into rudimentary public baths. Now, these have become a sprawling complex. The design is pragmatic but there’s everything—a large indoor pool, a larger outdoor pool, private rock pools, a beauty treatment centre, saunas, soak pools, and for the adventurous types, a oiling hydro slide. A caravan park with facilities that I can only describe as fair is right next door. We found it comfortable with the added bonus that we received a 50 percent discount to use the pools. On the far shore of Lake Rotoiti is the Manupirua Springs Thermal Baths. Situated right on the water’s edge, the pools vary in temperature and when things got too hot, I cooled off (quickly) in the lake. But to get to the pools (and I recommend you do), you have to paddle your own canoe. River Rats has canoe hire and you can make your own way or go in a guided group. addling time is around one hour each way. I didn’t find the paddle too arduous although my arms were tired by the time I reached the final shore. I know I have mentioned The Lost Spring in a recent story on Whitianga but in case anyone missed it, here it is again. These pools should not be lost to anyone. Walking into the restaurant and bar with views over a pool and waterfall was like wandering into a five-star resort. Continuing through the maze of tropical foliage, paths, caves, waterfalls, rocks, and quietly steaming pools transports the imagination to a plush tropical island. Don’t hesitate to find The Lost Spring for yourself. It’s not the cheapest experience but its worth is certainly not lost on me. 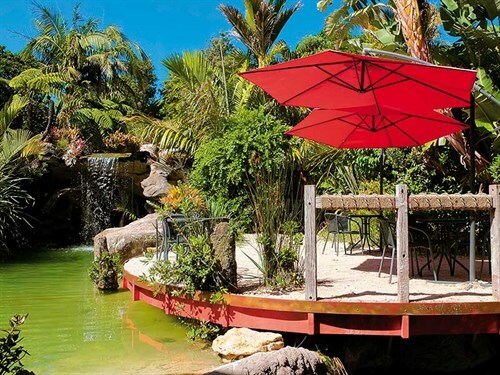 It’s easy to flash past Morere Hot Springs, which are tucked into 350 hectares of native forest along the road from Gisborne to Wairoa, but it’s a mistake to do so. Before I’d put a toe in the warm water, the silence was soothing as the pools are set in the largest stand of lowland rainforest on the East Coast. There are private plunge pools and two swimming pools (warm and cool) but I chose to walk up through the forest to the three, open-air plunge pools—hot, warm, and cold. The pools are fed by springs that produce 250,000 litres of the salty hot water every day that gushes from an ancient seabed. The bush is wonderful—a tangle of matai, beech, rimu thick groves of nikau palms. Of the several walks (10 minutes or up to three hours), I took the short Nikau Walk to make sure my legs were still working. Anyone who uses the pools is welcome to parking overnight if in CSC vehicle.